Contains complete proteins, providing the nine essential amino acids. May improve insulin sensitivity and combat stress. Reduces post-prandial blood lipid levels. 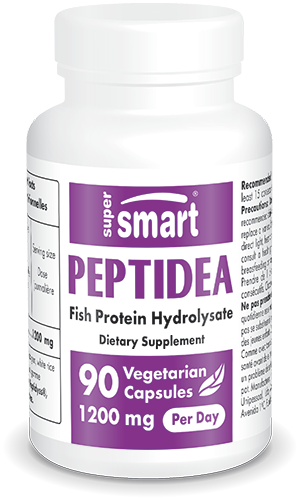 Peptidea® is a fish protein hydrolysate. It consists of peptides, 18 amino acids with a molecular weight lower than 1000 daltons, acting as precursors of endorphins and other neurotransmitters such as serotonin and melatonin, which play a regulatory role in the nervous system. They therefore help the body to adapt effectively to physical or mental stress.
) by the adrenal cortex. Cortisol, often called the stress hormone', is known to have a blood sugar-elevating effect. At high levels, it stimulates protein catabolism (formation of amino acids). During prolonged periods of stress, high levels of cortisol are secreted, potentially damaging the limbic system involved in emotion, as well as weakening immune defences. Trials conducted on rats show that, under conditions of stress, Peptidea® helped reduce the intensity of ACTH secretion. In addition, in animals treated with Peptidea®, the rate of transport of adrenalin and noradrenalin was slower. Finally, a change in GABA levels (gamma amino-butyric acid) in the brain was observed, similar to that resulting from an injection of benzodiazepine. · offered effective relief from symptoms of fatigue, anxiety and depression caused by chronic stress. Other ingredients: magnesium stearate,microcrystalline cellulose, silicon dioxide. Peptidea® - ID MER. Each vegetarian capsule contains 200 mg of Peptidea®. Take between one and six capsules every morning for at least 15 consecutive days. Warning: Do not take Peptidea® if allergic to fish.